Meeting at The Masonic Hall, Old Orchard Street, Bath. BA1 1JU at 18.30 on the first Wednesday in March, April and November (installation). The Lodge has 22 subscribing members. November 2018 Denis receives his 50th Certificate! It would be fair to say that there are normally three highlights to a Masonic year. Secondly the Elevation (Installation) of a candidate into the Order. Thirdly a visit from the Provincial Grand Master. At the recent meeting (8th November) of Bath Lodge of Royal Ark Mariners, two of the three were achieved. W.Bro. Frank Silver installed, in an exemplary manner W.Bro. Richard Thurston as Commander of the Lodge. This was in the presence of the PGM. R.W.Bro. John Morgan and the Deputy Provincial Grand Master W.Bro. Phil Voisey. However, the Lodge added a new highlight that evening. R.W.Bro. John presented W.Bro. Denis Calderley with certificates and a lapel pin to celebrate 50 years as a subscribing member of the Lodge. Denis was also presented with a commemorative wine goblet from the Lodge for not only his service to the Lodge as a member but also for more than 30 years as its organist. Bath Lodge of Royal Ark Mariners however had the pleasure of experiencing such a gathering at its Installation meeting on 2nd November 2016. Twenty one other brethren enjoyed the company of R.W.Bro. John Morgan, (PGM for Somerset), R.W.Bro. 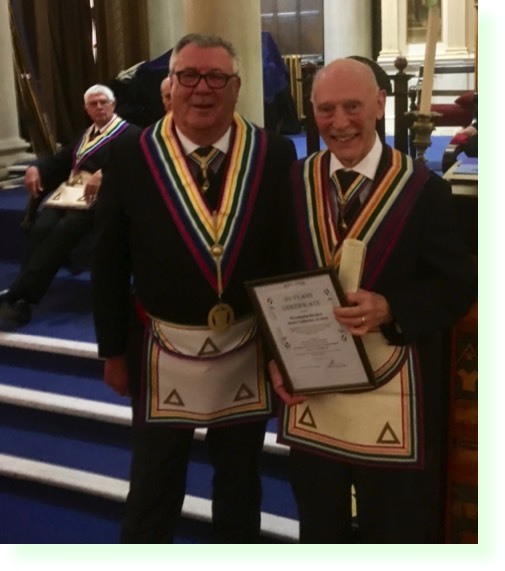 Ewan Page (Past PGM Berkshire, Member of Grand Masters Royal Ark Council Honoris Causa and member of the Lodge) and R.W.Bro. David Nelson Past PGM for Somerset during an excellent evening when W.Bro. Derran Lobb installed Bro. Trevor Quartermaine as WCN. Probably the comment of RWBro. John is the best way to describe Bath Lodge of Royal Ark Mariner Small in numbers, friendly banter ensuring a happy meeting and an excellent festive board. April 2013 Bath Lodge of Time Immemorial has had a very successful year with two good candidate Bros. Trevor Quartermaine (WC Right) and David Anthony (WC Left) pictured either side of the Worshipful Commander Richard Thurston, (centre of photo). Installation night, 3rd November 2010. John Nicholson, the new Commander in the centre. Flanked on his right by Derek Shailer, representing the PGM and Frank Silver, Junior Warden. On his left is Richard Thurston, Junior Warden and Mark Golding Provincial ADC.